Murder of three Muslim students by a North Carolina man shake up the Muslims worldwide. Thousands gathered to mourn the killings and denounce intolerance, they were studying whether the slayings were racially motivated, it is condemn-able. 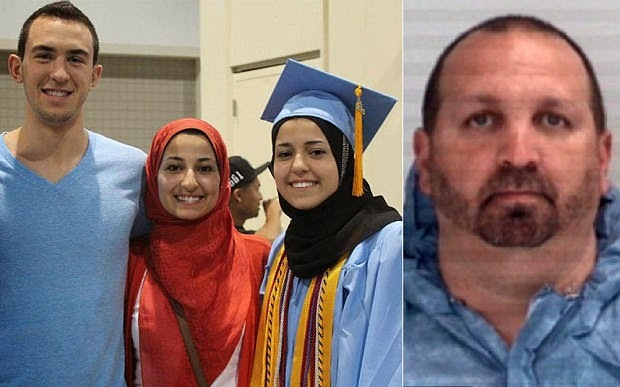 Craig Stephen Hicks, 46, has been charged with three counts of first-degree murder after Tuesday`s shootings in the university town of Chapel Hill which sparked outrage among Muslims worldwide. Police emphasized that initial investigations indicated a dispute between Hicks and his victims over parking spaces may have been the catalyst for a shooting spree which claimed the lives of Deah Shaddy Barakat, 23, his wife Yusor Mohammad, 21, and her sister Razan Mohammad Abu-Salha, 19. Chapel Hill police said in a statement, ''Our preliminary investigation indicates that the crime was motivated by an ongoing neighbor dispute over parking.'' According to them Hicks was cooperating. Police Chief Chris Blue said, "We understand the concerns about the possibility that this was hate-motivated and we will exhaust every lead to determine if that is the case." Meanwhile, thousand gathered in Chapel Hill to mourn the killings, with Barakat`s brother urging calm in the shaken university town. "Do not fight fire with fire... it is quite possible that this was an act based off of evil and a scared ignorant man. Do not let ignorance propagate in your life, do not reply ignorance with ignorance," Farris Barakat said at the candlelight vigil. He remembered his brother’s passion for sports, community work and the odd Chris Rock joke and said all three had an impact. "We lost three great citizens of this world and of this country. But I think they've inspired thousands." The cautious wording of the police statement contrasted sharply with the anguished reaction among many Muslims, however, and the father of two of the students demanding investigators treat the killing as a "hate crime." "This was not a dispute over a parking space; this was a hate crime," said Mohammad Abu-Salha, the psychiatrist father of the two women shot dead. "This man had picked on my daughter and her husband a couple of times before, and he talked with them with his gun in his belt." Abu-Salha told the local News & Observer newspaper his daughter had voiced fears about Hicks last week. Muslims across the globe meanwhile were quick to latch onto a viral campaign which asserted that the tragic killings had been under-reported by the US mainstream media because of the ethnicity of the victims.